The very popular Silent Cut 21″: The Silent Cut 21″ reel mower is arriving at our warehouse this week. 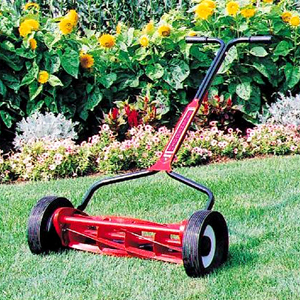 This reel lawn mower is the best reel manual mower for cutting Bermuda and Zoysia grass. Six Blades: The Silent Cut features six blades and is personally adjusted before being shipped to the consumer. This push reel lawn mower is an excellent piece of machinery, if taken care of this push reel lawn mower will last a lifetime. The blades can be adjusted from .5″ to 3″ depending on the model you purchase. 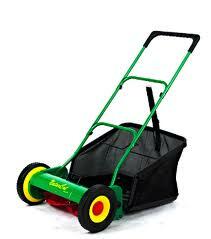 Additional Features: The Silent Cut 21″ and 18″ reel mowers allow you to purchase a grass catcher and a sharpening kit. It is recommended that you sharpen your blades about once a year. May has been a busy month here at Greenfox Schools! In addition to our spring programs and classes, our team has taken part in several events to benefit local students and the environment. We are exited to share with you a bit about the wonderful things we have been a part of this month and the events we have in store! Read on to find out more! Join us this Thursday, May 26 at Kitty O’Sheas where we will hold our EarthFest After Party! Kick off Memorial Day weekend with a fun night of friends, drinks, and great raffle prizes, while giving back to the environment & local school children! Help us reach our goal of raising $5000 to expand afterschool programs. To learn more about this event, click here or visit our event page at http://www.facebook.com/greenfoxschools. This past Satuday, May 21st, the Greenfox Team hosted a booth at Boston’s 92.9 Earthfest 2011. The event, which annually attracts over 100,000 people, was a huge success! Greenfox Schools’ Development Coordinators, Tara Fortunato and Kat Parkinson Gaska, organized Greenfox’s participation at the event, and were joined by Greenfox5 Global Fellow, Cece Santos, and Founder, Kristen von Hoffmann. The team was on hand running a seed-planting activity for hundreds of children and visitors who stopped by to check out Greenfox Schools, and the team educated visitors about Greenfox Schools’ educational programming and mission. Children and visitors at our booth planted a variety of organic vegetable seeds in compostable pots, which they decorated and took home to plant. Fresh Pond Day was a great success this year at the Fresh Pond Reservation in Cambridge, MA. On May 7, many people came out to celebrate one of the city’s largest open spaces with nature walks, story telling, and many other activities that celebrated our local environment. Greenfox Schools ran a booth at Fresh Pond Day and helped with the Adopt-A-Tree program. In an effort to increase the number of trees in Cambridge, the Adopt-A-Tree program, headed up by Ranger Jean Rogers, gave residents free pine, spruce, and cedar seedlings. Greenfox team members Ashlee Dahlberg, Tara Fortunato, Kristen von Hoffmann, and Audra Burns handed out trees to residents and talked with children and families about tree care and Greenfox educational programs. On Saturday, May 23rd, Greenfox Schools was represented at Youth CAN’s annual Climate Change Summit at MIT. The summit brought together students in grades 7-12 and educators of students in grades 7-12 for a day of workshops, entertainment, and a key note address from Colin Beavan, No Impact Man. The special theme of this year’s summit was food, and students were empowered to become educated consumers who understand the importance of their food choices for personal health and the health and sustainability of the larger community. Cece Santos, Greenfox5 Global Fellow, has written a recent article for Greenfox Schools entitled, “Urban Sustainability and Society.” Check it our on our blog. Cece writes about a lecture she recently attended at Boston University’s “Discoveries Lecture Series” on behalf of Greenfox Schools. The lecture was called “We Are What We Eat: Issues of Food Supply,” and Cece writes about Professor Nathan Philip’s take on how to balance industrial food systems with high quality-of-life standards. Her take-home point was the simple question, “do my daily actions help the planet or drain it?” This question, she explains, can help students as well as adults take their first steps towards a sustainable lifestyle. We hope that you enjoyed our May Newsletter. Don’t forget to visit us online at http://www.greenfoxchools.com to learn more about the organization and to find out how you can get involved. Thank you for your support! NaturCut Grass Catchers: Yesterday we wrote about how we thought the NaturCut Universal Grass Catcher would work on Brill Razorcut 38 Reel Lawn mowers. Our man tested the catchers yesterday and found that the NaturCut Grass Catcher works for both the Brill Razorcut 38 and the Brill Razorcut 33! Great news! 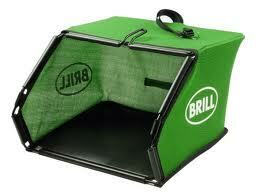 Brill Grass Catchers:The US supply of Brill Grass Catchers is running very low and will soon be depleted. We do not expect to have more Brill Grass Catchers this season. So having the NaturCut Grass Catcher fit and work well with the Brill mowers is wonderful news. 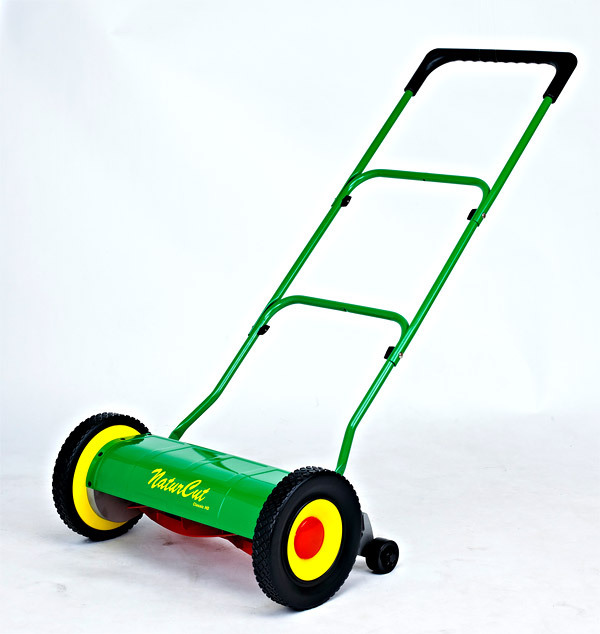 Brill Mowers: If you are in the market for a Brill mower and want the Grass Catcher. We have you covered. Brill Razorcut 38 Grass Catchers: We have just learned that the US supply of Grass Catchers for the Brill Razorcut 38 will soon run out. That would be a bummer especially with restocking forecasted as taking 6 months. NaturCut Grass Catchers work with the Brill Razorcut 38: We have made some inquiries and believe that the NaturCut Grass Catcher will also work on the Brill Razorcut 38 Reel Mower. If this is true, this will be great news for the spring and summer seasons. More Testing: We will be testing the NaturCut Grass Catchers on the Brill Razorcut 38 soon and will let you know how they fit and work. 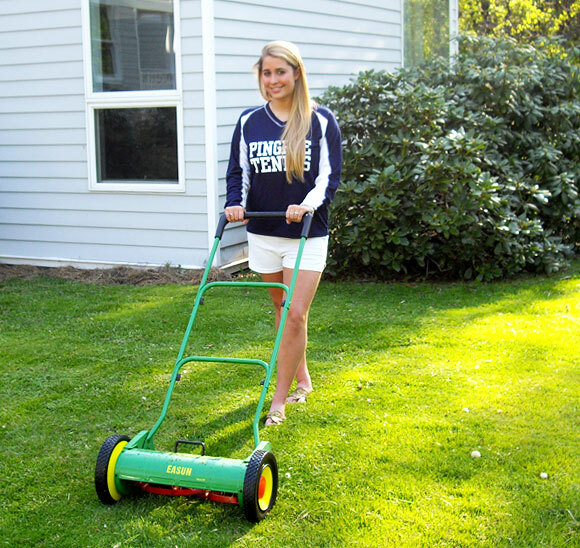 Depending on the variety of grass and thickness of your lawn, your NaturCut Classic Reel Mower 0r Ideal reel mower may cut perfectly right out of the box. You can fine tune the cut to your lawn by spending less than 10 minutes adjusting the blade gap to enjoy a truly great cut and easy to push mower. You can use your NaturCut mower with the blades in this ‘minimal-contact’ position in order to cut fine-bladed grass or lawns with dandelions. However, if the NaturCut Push Reel Mower is hard to push, seizes up or leaves a ‘scalloped’ effect on the grass the gap is probably too tight for your variety of grass. You may then want to try to use the non-contact cutting adjustment. To cut with the non-contact adjustment, turn the blade bolts equally counter-clockwise, in small increments of 1/8 turn, until the bed knife blade doesn’t touch the rotating blades. Before any further adjusting try cutting your lawn with the NaturCut Push Reel Lawnmower. The mower will probably cut just fine. As above, if the mower is hard to push, seizes up or leaves a ‘scalloped’ effect on the grass the gap is probably still too tight and will require a bit more adjustment. If the mower leaves uncut grass the gap is too wide. Also, once the gap is over about 1/10 mm you will find that the mower will bind with too much grass getting stuck, uncut, in the blade gap (like too many sheets of paper in a shredder). If you get too far out of adjustment it is easiest to start over by getting the blades to evenly touch again. The trick here is to find the ‘sweet spot’ in the blade gap for your particular variety of grass and circumstance. Always adjust each bolt the same as the other to keep the blades parallel and don’t be a slave to the blade gap gauge that comes with your mower- that is a nominal preset only. It takes so little time to properly adjust your NaturCut Classic or NaturCut Ideal Reel Mower that it is well worth the effort. The Popular Silent Cut 21″ is out of stock in both configurations. The Silent Cut Small Wheeled version in the 21″ model is out as well. These mowers which cut all grasses but are especially well liked for their handling of Bermuda and Zoysia Grasses. Silent Cut 18″ are in stock. We are pleased that the Silent Cut 18″ is in stock. Both the regular 18″ and the Silent Cut 18″ with Large Wheels are in stock. We expect to have the 21″ models in both styles in stock the week of May 20, 2011.